With inspiration to find the best coffee beer from around the USA, we are headed to the Great American Beer Festival (GABF) in Denver. In this article, we will feature 55 coffee beers being poured at the festival, and we hope you find your new favorite beer! Below, our list features 55 craft beers with actual coffee as an ingredient, which is, in Kim’s opinion, “more delicious than a ‘note of coffee,’ or ‘coffee aroma. '” While you are planning your trip to GABF 2016, consider discovering these coffee beers. Thanks to Porch Drinking’s GABF Pour List Preview, you are privy to seeing a good portion of breweries beers BEFORE the GABF releases the list! (That being said, this is hopefully not an exhaustive list. Please email inkybeer@gmail.com to let us know if you’re pouring a coffee beer and we will add it to this list.) Here’s a link to the GABF festival map, as well. 6.7% ABV full-bodied blond ale, brewed with milk sugar to give a sweet rounded finish. Vanilla, coffee and cacao are added to the maturation tank to give this beer a stout like quality. 9.5% ABV Coffee Stout. Get through the day. You can do it. Don’t rip your eyeballs out and throw them at a coworker. Home is right around the corner. Over 3.5 pounds of locally sourced espresso beans per barrel in this hog. 12.5% ABV Russian Imperial Stout w/ cocoa nibs, Madagascar Vanilla Beans, toasted coconut, and coffee. 6.4% ABV Adambier handcrafted using a blend of supreme roasted malts, delicately aged on hand-picked espresso coffee beans from Valentine Coffee Roasters, Milwaukee, WI. Smooth and full on the palate with a roasted finish. This 7.5% ABV Belgian style Dubbel, aged in bourbon barrels with coffee, cacao nibs and then finished with chili d’arbols. 5.8% ABV Coffee Stout. Smooth with velvety cream cascading into a jet black, darkly enticing brew, revealing a rich, robust character. The roasted malts create notes of bittersweet chocolate with hints of dark fruit, while Sumatran and Indian coffee adds a deep roast dimension. 11.5% ABV Barrel Aged Stout with intense coffee stout with notes of chocolate, aged in bourbon barrels. 5.8% ABV. Our take on a Mexican Horchata, this Mexican Lager is bursting with cinnamon and vanilla. Made with Malted barley, rice, flaked grains, and a hefty dose of lactose balanced with Whiskey Barrel Coffee Company cold brewed coffee. 7% ABV Coffee Beer. We’ve all seen great dark coffee beer. We wanted to try a lighter, hoppier brew infused with rich coffee flavors. The result? Unreal. 9% ABV Coffee Brown Beer. 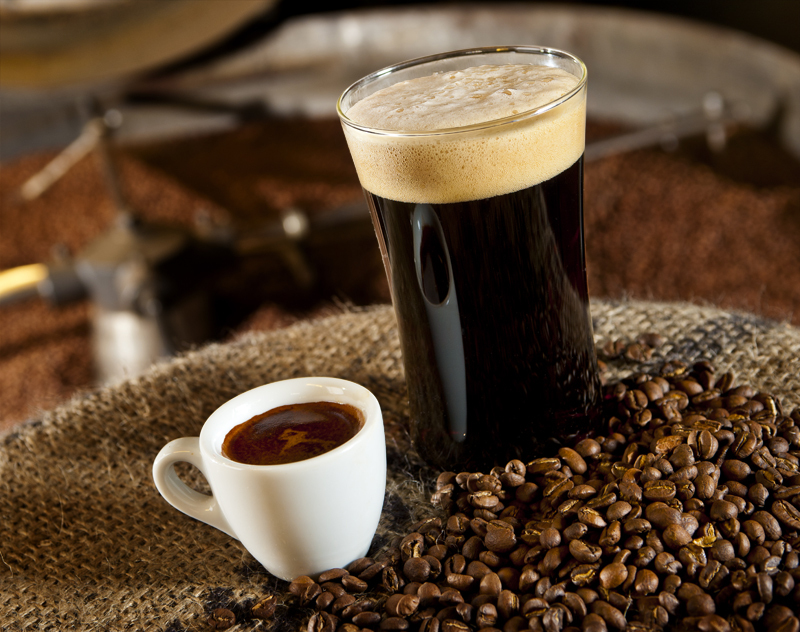 The addition of rich Sumatra coffee elevates this bold, brown ale to a decadent level. 6.4% ABV Coconut & Coffee Porter is an ode to that special time in Florida where the needle dips just south of 75 – even for the briefest of moments. This rich, creamy porter is layered with coconut and freshly roasted coffee. 6.4%ABV porter evokes a complete diner-style breakfast in a glass, Maple Bacon Coffee Porter is a complex beer with a multitude of flavors at play. It pours an opaque ebony brew with a frothy tan head. Aromas of sticky maple syrup, coffee, and cream creep forth. 7.3% ABV Coffee Stout tastes even better than it smells. Roasty, coffee-chocolate deliciousness. Medium-bodied. 6.4% ABV Coffee Stout combines the flavor of organic roasted malts and Milwaukee’s renowned organic Fuel Café coffee. Pours a deep, dark color with a beautiful creamy tan head. Coffee aromas dominate the nose, with a background of roasted malt. 7.3% ABV Coffee Lost Highway is our Black IPA which is blended with Mother Road Cold Start coffee. The added cold brew coffee releases notes of dark chocolate, vanilla, Nuttiness & slight berry notes. 13.5% Imperial stout with 5 pounds per barrel of whole bean dark roast coffee. 9% ABV IPA with Coffee and Cacao. 10.5% ABV Imperial Stout has a sweet, caramel malt backbone and a rich, chewy, thick mouthfeel is perfectly complemented with maple syrup and a huge addition of freshly roasted single origin Peruvian beans. 5.2% ABV traditional cream ale is aged on rich and roasty coffee beans. Light in color, big in coffee flavor. 7.4% ABV stout tricked out with all sorts of breakfast ingredients including Guatemalan Antigua cold press coffee, Maple syrup from Western Massachusetts and for the quintessential Delaware breakfast touch- Rapa Scrapple and their secret blend of spices. 5.8% ABV Little Red RooStarr Coffee Stout is a full-bodied milk stout brewed with locally roasted coffee. Malt sweetness, chocolate and caramel notes dominate the flavor, while roasted coffee notes add balance and round out the aroma. 10% ABV Adambier. Our silky smooth vanilla coffee goodness, Tiramisu Stout, aged with bourbon barrels. 9% ABV Milk Stout brewed with whole vanilla beans, rum soaked oak chips and Ironclad Coffee Co. Brazilian coffee. 6.3% ABV Sweet/cream stout was used for base beer infused with ground coffee during conditioning with a blend of African and South American coffee beans. 4.4% ABV, Milk Stout with locally roasted Guatemalan and Costa Rican coffee. Full bodied with a milky and caramel sweetness followed by a mild roast from roasted barley and the coffee. 5.9%ABV Coffee Stout. The fresh coffee aroma and rich roasted taste of our limited-release Cappuccino Oatmeal Stout is the perfect way to unwind and catch up with friends this winter. 12% ABV Imperial Stout aged in whiskey barrels with cacao nibs and small batch coffee. 6.6% ABV Cream Ale with coffee on Nitro. 8% ABV Imperial Stout with cacao nibs and artisanal small batch coffee. 8% ABV Coffee Double Brown Ale with cold-brewed coffee. 5.5% ABV, a hoppy pale ale infused with African coffee. Starts coffee, finishes hoppy. 5.5% ABV crisp and clean pale ale infused with a powerful dose of fresh, locally roasted coffee. 5.7% ABV hazelnut coffee milk stout. 7% ABV Coffee IPA, our signature IPA dosed with cold brewed Ethiopian coffee roasted by Logan House. 10.4% ABV, Bourbon barrel-aged Belgian-style strong ale blended with cold press coffee. 18% ABV! This big, unabashed creation was made with roasted malts balanced with Saaz and Apollo hops to bring out a fresh mouth feel. But have no doubt, this Imperial Espresso Stout was brewed for the bold. 6.7% ABV Coffee porter aged with Counter Culture coffee; notes of fresh roasted coffee and baker’s chocolate. 11.5% ABV Barrel Aged Imperial Stout, named for the witch who guarded the fountain of life and death in Russian folklore, the black depths of this Russian Imperial Stout hold coffee, licorice, and bittersweet chocolate flavors. 10% ABV. We infused this robust porter with vanilla and San Diego’s own Caffe Calabria coffee beans. The subtle roasted notes and minimal acidity of the cold brewed coffee, balances perfectly with the sweet caramel undertones of the malt. 6% ABV Chocolate Coffee Oatmeal Milk Stout. 7.3% ABV Sweet Stout has a rich and creamy texture from the addition of lactose, balanced by a roasty aroma and subtle bitterness from the coffee. 8.2% ABV. Deep, dark mahogany in color with a luscious tan head, our Imperial Coffee Porter boasts aromas of decadent chocolate and fresh coffee. 10.93% ABV Imperial Porter aged in Tequila and Bourbon barrels, finished with Mostra Coffee and Mexican Chocolate. 17.4% ABV Imperial Stout aged in Bourbon barrels with coffee, cocoa, cocoa nibs, and vanilla beans added. 8.5% ABV Northwest breakfast stout brewed with local Oregon coffee and maple syrup. 7.5% ABV Stumptown Coffee Roasters’ Cold Brew Coffee is blended with an IPA made using Rogue Farms hops for a unique interplay of hops and coffee flavors. Our 8% ABV American Stout is brewed and aged with Alltech® Café Citadelle Haitian coffee and aged in world-famous Kentucky bourbon barrels. 9.8% ABV rich, roast-heavy imperial stout with fresh Argyle Coffee Roasters coffee added. 6.5% ABV Belgian Dubbel cold-steeped with Ethiopian coffee beans. 11.2% ABV British-Style Imperial Stout is luscious and dark, this stout was brewed with local coffee, cocoa nibs, and vanilla. 5.8% ABV Oatmeal Stout brewed with an abundance of espresso and dry hoped with coco nibs, this Oatmeal Stout is smooth yet extremely complex. The balance of coffee and dark chocolate makes this stout a perfect beer choice for breakfast or after a long day of skiing. 8% ABV “happy accident” is brewed with twice the coffee as our original Coffee Oatmeal Stout. The coffee comes from local Due South Roasters in Taylors, South Carolina. 9.3% ABV Russian Imperial Coffee Stout. Happy coffee beer drinking! Please comment below and tell us which beer is your favorite. Do you like chocolate beer? Chili beer? We made those beer guides for you, as well. Previous Post Ask A Cicerone: How can I drink a weird combo of beers at GABF and still enjoy them?